In 1981, The Road Warrior became an arty, pedal-to-the-metal slice of action that caught critical eyes as a stand-out in Lincoln Center’s New Directors, New Films series. At the time, few moviegoers had seen Australian director George Miller’s original entry into the series, 1979’s Mad Max. Likewise, few knew that Road Warrior’s star, Mel Gibson, had a passion for controversy and for Christ. Miller followed Mad Max 2: The Road Warrior with 1985’s Mad Max Beyond Thunderdome, a bigger and more heavily promoted movie that added Tina Turner to the mix. This record suggests that Miller marches to his own drummer, which is why I’m beginning with background that usually gets buried in the depths of a review. 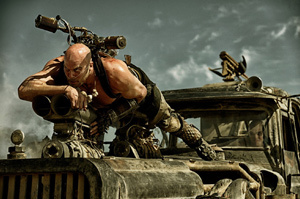 In Mad Max, Fury Road, Miller, who’s now 70, resurrects Mad Max with British actor Thomas Hardy taking over the Gibson role and Charlize Theron adding additional marquee appeal. Steeped in action, brutality and creative daring, Mad Max: Fury Road hardly qualifies as an actors’ movie. With her hair shorn to crew-cut length and one arm digitally omitted, Theron proves that she, too, can be an action star. Hardy — a fine and volatile actor — spends a good deal of the movie hidden behind an iron mask that Hannibal Lector might have regarded as a fashion statement. The past — a lost family — haunts Max, but Hardy seldom loses touch with Max’s inner animal. All of Hardy’s dialogue might not fill a cocktail napkin, and Theron (really the dominant presence in the film) benefits greatly from her character’s name, Imperator Furiosa, which sounds like some forgotten and possibly disreputable Latin classic. The action set pieces in Mad Max are so kinetically charged and bizarre that I spent a good deal of time wondering how Miller had managed to pull them off. I was more interested in what Miller and his team would do next than in the whisper of a plot that blows across the endlessly brown landscapes Miller found in Australia and in the South African desert. The movie’s most visionary achievement occurs early. Miller introduces us to The Citadel, a fortress carved into a cliff. A warlord, Immortan Joe (Hugh Keays-Byrne) rules this outpost. When he’s feeling especially good, Joe releases torrents of precious water from giant spigots, a gesture of totalitarian beneficence that’s supposed to soothe the benighted multitudes who serve him. Some of Miller’s Citadel shots made me think of what Hieronymus Bosch might have painted had he lived in the age of the graphic novel, a hellish reversion to undisguised primitivism. So here’s the story: Captured by Joe’s hordes, Max escapes, and hits the road. He eventually allies himself with Furiosa, who’s fleeing the Citadel with five of Joe’s wives, all of whom have lithe fashion-model figures. They’ve been selected to give birth to Joe’s heirs. Equally important are the costumes and vehicles. The latter seem to have been cobbled together from the spare parts of the world that preceded this post-apocalyptic chaos. These range from vehicles that look like spiky, metal porcupines to trucks from which giant poles extend, allowing combatants to tip one way or another as they attempt to smash the opposition. A movie or Cirque du Soleil? Maybe it doesn’t matter. There’s no faulting Miller’s imagination. One of Joe’s vehicles — always in hot pursuit of Furiosa, Max and the runaways — tethers a punk-rock guitarist to its hood. The rocker’s heavy-metal licks are accompanied by ejaculated bursts of flame that shoot from his guitar. That’s the kind of humor, you’ll find here, along with at least one terrifying mask. Joe, who somewhere along the line lost much of his face, wears a mask that makes the Joker’s frozen rictus look like a wan smirk. Surprisingly, a few quiet moments and even a bit of touching humanism can be found amid the debris. Nicolas Hoult plays Nux, a former Joe loyalist who eventually sides with Max and the fleeing women. Nun has an endearing quality. And when Max finally reveals his name to Furiosa, the moment seems emotionally authentic in a stammering sort of way. Such bits stand out because, as Max tells us at the outset, nothing is more important in this world than survival. Anything else should be deemed a debilitating luxury. Miller makes this clear from the outset. Our introduction to Max consists of watching him stomp a scurrying lizard, which he then eats. Despite the presence of the occasional emotional oasis, Mad Max ’s throbbing, remorseless pace can cause the action to lose edge, a danger when a movie seems intent on bombarding us with epic-scaled overkill. You can get a little numb. Fury Road may no longer have the kind of surprise quotient that accompanied its predecessors, but it retains the eccentricity of Miller’s strikingly weird vision. Whatever else you may think about Mad Max, pay attention to the word “mad” in the title. This is one demented action movie. I mean that in a good way — I think.